Mount Kilimanjaro National Park is a sprawling ecosystem that covers an area of 1,688 square kilometres, or 652 square miles. In 1921, The area was established as a forest reserve, followed by a national park in 1973 and a UNESCO World Heritage Site in 1987. This protection has allowed the animals in the Kilimanjaro area to resist habitat encroachment by humans. As climbers will certainly notice on their journey to the summit, Kilimanjaro encompasses a wide variety of ecological zones: bushland, rainforest, heath, alpine desert and arctic. The resources to support life – plants, insects and available water sources – decreases as the elevation increases. Accordingly, the wildlife in each zone diminishes as you approach the peak. The majority of the park is in the montane forest belt. This area is teeming with wildlife. There are recordings of 154 species of mammals on the mountain, including 7 primates and hundreds of bird species. There have been some rare spottings of large mammals such as elephants, giraffes, buffalo as well as smaller, unique mammals such as porcupines, honey badgers and aardvarks. However, most of the time, these animals stay away from humans and hide in the thick, lush rain forest. Here are some common animals that you have a good chance of seeing on Mount Kilimanjaro. 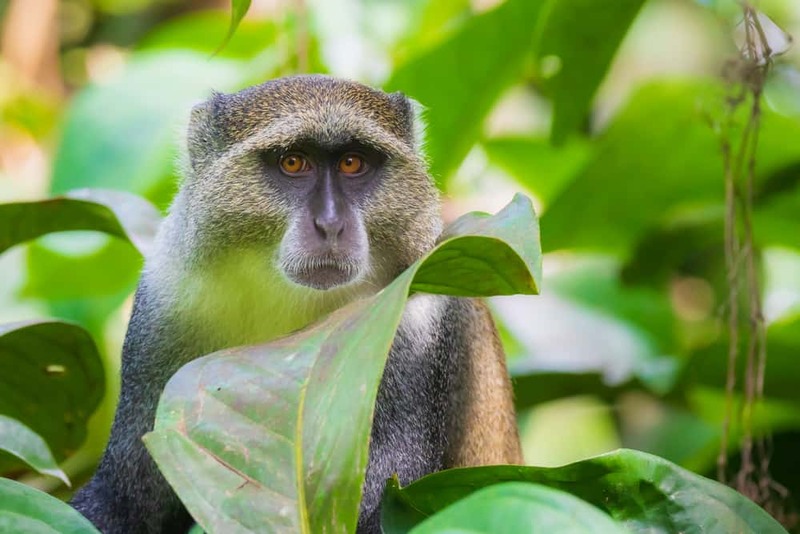 The Blue Monkey, also known as the Diademed Monkey, can be found in Kilimanjaro’s rainforest, especially around Big Forest Camp (the first campsite on the Lemosho Route). The name is misleading because the primates aren’t especially blue. The body is an gray and olive color with patches of white and black. Their face is darker with some yellow or paler patches to the forehead. Their eyes are reddish brown. The Blue Monkeys mainly stay in tall trees which provide both food and shelter. They primarily eat fruits and figs, but will also eat insects, leaves, twigs, and flowers. The White Necked Raven is aptly named for the prominent white band on the back of its neck. Ravens are very intelligent birds, and this variation is no exception. Ravens are said to be smarter than a 7 year old human. They are capable of abstract reasoning, complex problem-solving, and group decision-making. Ravens can even be taught human speech, as the video below demonstrates. White Necked Ravens are omnivorous. Their diet consists of fruits, grain, insects, carrion, small mammals and reptiles, and human food. You will undoubtedly see these large birds flapping and squawking around at your campsite, waiting to scavenge food. Leaving your daypack unattended can be a costly mistake as these naughty crows are daring enough to break into it to eat the goodies. 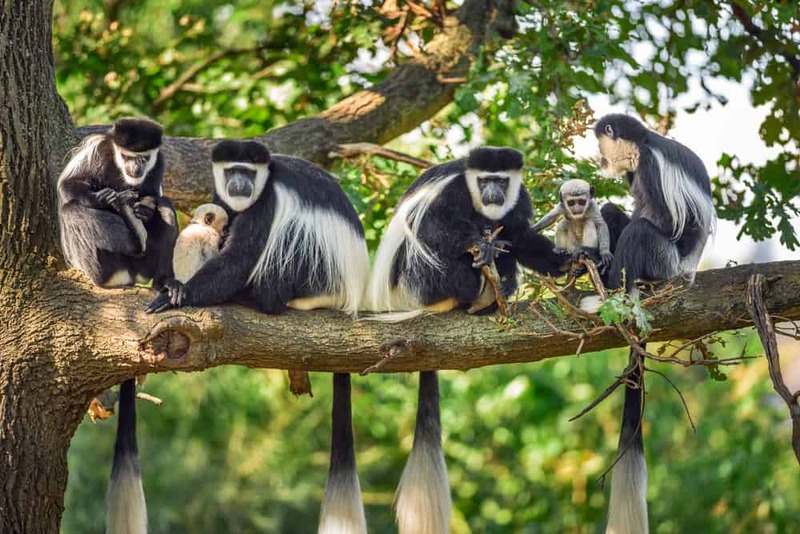 The word “Colobus” comes from the Greek word “kolobos” meaning maimed or mutilated. This unflattering meaning comes from the fact that this monkey does not have thumbs. This adaptation came about due to its arboreal living. Having fingers that are more like hooks are more effective for swinging among the forest canopy. The Colobus Monkey has a striking contrast of color. When they are born, they are totally white but transform into their unusual black and white appearance as they age into adulthood. What is most spectacular are their fluffy white tails measuring two feet long. These monkeys can be seen near the Kilimanjaro trailheads and throughout the rainforest section. Like the Blue Monkeys, Colobus Monkeys live in the trees and rarely come down to the ground. They eat mostly leaves, fruits and flowers. Colobus Monkeys have ruminant like stomachs, with three chambers that help them digest leaves. Wherever you find humans, you almost always can find rodents. These mice are slightly larger than house mice and look like a lot like a chipmunk. It has four black stripes down its back. Unlike other mice, they are more active in the mornings and late afternoons, resting during the middle of the day. Also, although living together in groups, they are also solitary foragers. The Four Striped Mouse likes to make its home at Kilimanjaro campsites and huts, where food is plenty. They mostly feed on a wide range of green plants, seeds, invertebrates, and human scraps. Bush babies are known by many names – Galagos, nagapies, “little night monkeys.” The “baby” moniker comes from their human baby-like cries that can be heard in the night. These noctural creatures have big, round eyes that give them good night vision, and a brownish grey to light brown coat. They have great agility and can leap far distances from tree to tree. They eat insects, such as grasshoppers and moths, which they catch on the ground or grab straight out of the air. They also eat other small animals, fruit, and tree gums. The Bush Baby lives in tree hollows that provide shelter. And though they are fairly common, they are not easily seen due to their nocturnal behavior. Want to see these creatures for yourself? Climb Kilimanjaro with us and keep your eyes peeled for these furry animals on your own Tanzanian adventure. 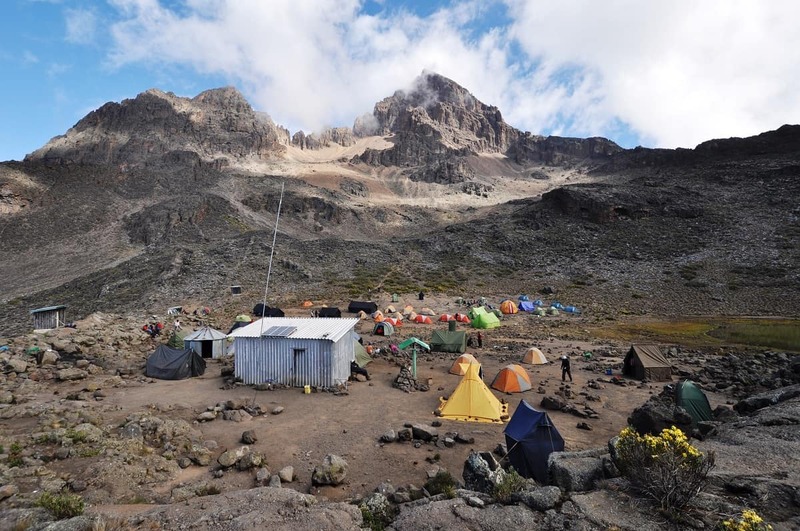 Comments Off on What Do People Do at Kilimanjaro Campsites? Comments Off on YIKES! Are there Snakes on Kilimanjaro?